Imagine walking through the city and triggering moments in time. Imagine wandering through a space inhabited with the sonic ghosts of another era. Like ether, the air around you pulses with spirits, voices, and sounds. Streets, buildings, and hidden fragments tell a story. The setting is the Freight Depot in downtown Los Angeles. At the turn of the century Railroads were synonymous with power, speed and modernization. Telegraphs and Railroads were our first cross-country infrastructures, preceding the Internet. From the history and myth of the Railroad to the present day, sounds and voices drift in and out as you walk. 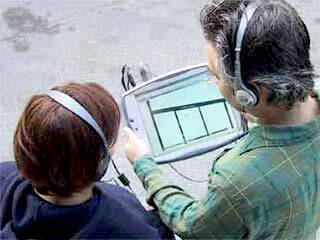 34 North 118 West plays through a Tablet PC with Global Positioning System card and headphones. 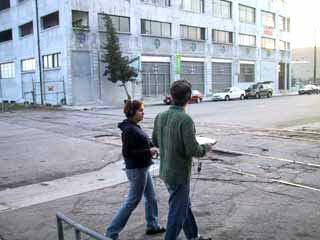 GPS tracks your location to determine how the story unfolds as you uncover the early industrial era of Los Angeles.